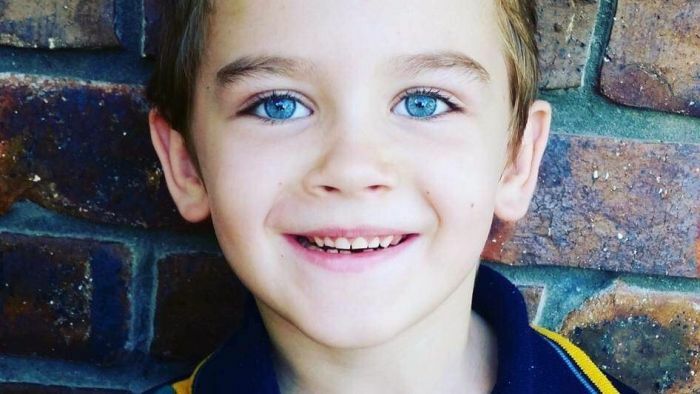 He loves playing in the backyard, going to the beach and learning at school, but a one-in-a-million genetic mutation has now taken that away from this eight-year-old boy. Miller O’Flynn can no longer walk, talk or sit, and needs to be fed through a tube into his stomach. The Sunshine Coast boy is one of two children in Australia with Pantothenate Kinase-Associated Neurodegeneration (PKAN), a debilitating and terminal disease that affects one in 1 million people. Most children with the disease die before the age of 10. Miller, who turns nine in November, receives palliative care assistance in Brisbane. His mum Sophie Cashen said it had been heartbreaking to watch Miller deteriorate since he was diagnosed with the condition three years ago. “He was always running around, cheeky, loved life and playing with his cousins, getting out, just living,” she said. Miller’s deterioration has been exacerbated by dystonia, a painful neurological disorder that causes rigidity and involuntary muscle spasms. Miller has not been impacted mentally by PKAN. “As much as he has lost his physical abilities he’s still in there,” Ms Cashen said. “He remembers all of the things he used to do, so when he gets to do those things it makes him really happy. The rareness of the condition means the family has no access to respite care because there are only three adults — Ms Cashen, her partner Andrew Rainford, and Miller’s dad Corey O’Flynn — who know how to take care of him. “He is in pain. It’s a very painful condition … while he’s awake it’s just a struggle to keep him safe,” Ms Cashen said. The disease has also rendered Miller housebound as he can no longer travel in a car. “He’s had these dystonic spasms with his back and legs, and so when he’s sitting up he’ll be spasming, and he needs to be laying down to be as pain-free as he possibly can be and breathe properly,” Ms Cashen said. A fundraising campaign has been established for a van to transport Miller in a horizontal position. Ms Cashen hoped one day she would be able to enjoy outings with her son and six-month-old Maison, “the apple of his eye”. “We feel pretty isolated not being able to leave the house … I don’t want to look back and not have those memories,” she said. Family friend Jess Ryder has known Miller since he was five and said it had been difficult to watch his physical deterioration. “With Miller now it would be making sure he has a good quality of life and understanding that people out there love him and want to know him, and understand that he is 100 per cent there,” she said. PKAN is caused by a misspelling or mutation in both parents’ genes and generally surfaces around the age of three. People with the disease cannot produce an enzyme required for brain and overall health. Without that enzyme their cells die, they lose the ability to control movement, and their muscles deteriorate. PKAN results in an abnormal accumulation of iron in one part of the brain which then degenerates, creating issues with walking, speech and swallowing. Research teams in the United States and the Netherlands have identified a compound, CoA-Z, that can correct a chemical block in the metabolic process of creating the necessary enzyme. Ody Sibon, a researcher in the Netherlands, discovered and tested the compound in fruit flies with PKAN, successfully relieving problems with their health and brain development. In the US, Oregon Health and Science University professor Susan Hayflick hopes to start clinical trials of the CoA-Z compound in humans early next year after successful tests in mice. “Everything we want to see we see, so it’s a very powerful model,” Professor Hayflick said. “We have a PKAN mouse that shows many of the chemical changes that we see in PKAN, and when we feed this mouse this compound we see a correction of all of the chemical changes in the mouse. A Therapeutic Goods Administration spokeswoman said while the organisation was aware of the CoA-Z testing overseas, the compound was not currently approved in Australia. Ms Cashen said Professor Hayflick’s trial in the US would give hope for other families. “It’s not very possible to travel with Miller so he’s probably not going to be part of that but, yes, there’s hope,” she said. In order to keep the compound as low-cost as possible, Professor Hayflick and her not-for-profit Spoonbill Foundation aim to raise $2 million to start the trials without investment from the big pharmaceutical companies. Ms Cashen said that was admirable. “They want to keep it out of the hands of the big pharmaceutical companies because they could very easily sell the drug for hundreds and hundreds of dollars just for one tablet, because it’s very, very rare,” she said.